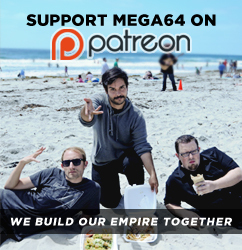 It's Tuesday, and that means The Mega64 Podcast Episode 85 is now up for your audio/visual pleasure. If you like the Terminator, Steven Seagal (or his fluids), or the Civil War, this podcast is RIGHT up YOUR alley. Watch below or subscribe to the left! Click here for audio version. I'm updating myself tonight to apologize- We've been meaning to put up a whole slew of new videos lately, but things keep getting messed up. We have some videos in the pipes that we've made on our own, and some through deals with others, and every time we go to release one or the other, the timing doesn't work out or steps on another video's release or something. I know that is completely vague and, frankly, uninteresting, but it's the truth. We like to bombard you with "funny vidz" as much as we possibly can, so we get bummed when we're not doing that. But fear not- the first of many new videos for 2009 might be surfacing as soon as later today! Please feign excitement. It's been just a lot of weird snags in general lately. Watch the podcast to hear what other strange fates have befallen us (especially with our merch). Enough of all that. What have you guys been playing lately? To de-stress a little before the upcoming late-February game onslaught, I've been catching up on some older games that I never got a chance to check out before. As much as I swore against it, I actually started playing Fable 2 recently. I thought I'd give the series a thorough try, given that I'd written it off before on not much more than a glance. I've into it much more now, and completing a lot of quests and whatnot- But I have to wonder, is there a lot more to it? I'm not terribly deep into the game, but I feel like it's kind of a neat timewaster and not much else. I've seen people speak pretty deeply about this series, and I wonder if maybe I just haven't played long enough yet? I dunno, should I keep going? I'm probably gonna pick up Loco Roco 2 this week, too. As much as I got kinda tired of the original one by its end, I am still finding it difficult to say no to colorful bouncy blob guys that sing for me. I am also getting Street Fighter on Blu Ray, but the reasoning for that is more along the lines of I'm an idiot. Stay tuned for some new stuff, soon. Finally.